Hearing My Heart: Tallinn Update - Winter at Last! Tallinn Update - Winter at Last! As we hit the first of December, so we had the first real snowfall. Winter has come at last! Over night, the temperature has dropped down to nearly minus five. The rain and overcast (slightly warmer) days have given way to sunny, clearer skies and noticeably colder days. But these are what make Tallinn winters so beautiful! And I much prefer sunny days in winter. So, as we hit December, a busy time of year for all, we wanted to send out an update in good time, before things get too festive, with all the news from us in Tallinn. As usual, our now annual (it will be our 5th one!) Christmas musical photo/video card will come out later this month, so keep an eye on this blog for when it does. The Winter Market in Tallinn has opened - this photo, I guess taken a few years ago, shows the setting for the market. The huts are set up a little differently now, but with the snow and lights, the effects are still as magical. It makes the Old Town, just that little bit more special. One thing we've often mentioned but not said too much about, is the weekly Sing & Play children and babies group we host at ours every Thursday. This is certainly Rachel's 'baby' - if I'm home, apart from being around to help set up a little (though not as much as Rachel needs often), I tend to get to listen through the walls as the flat fills up, talking to the parents as I make the odd drink, while working in the office. This group has continued to do really well. Please pray that Rachel and Elisabeth (who runs it with Rachel but has her hands full with 3 children of her own!) are able to get more help with it. Rebekah (who we'll mention again later) was able to help while here for ten nights recently - staying with us, and therefore here for set up and clear away, it really showed the great value this adds, and something Rachel is now missing with Rebekah being back in the UK! The other mums are getting involved too though and are now making a cake for the group each week. Once a month Rachel has now started including a Baby Massage class within the group. This is a skill she picked up when she had Mia back in the UK. She was given training and taught some classes in the UK at the time. It's funny the things that come back years later - like her Body Shop training with make-overs and facials that opened the door to working with the Butterfly project in Tallinn. The group of mums (there was one dad for a while, though his working pattern changed and he's not currently able to come) is a mix of several nationalities, but there are several Estonian mums coming, including one neighbour from the fifth floor of our building. She has helped with doing some of the songs in Estonian. These babies are all going to be singing in many languages! The last two weeks have seen some challenges - but I write this saying that as a team, we are in a much stronger place because of it all. I think the adjustments that we have made to our program, which came out of long conversations over about three days last week, have put us in a better position to move forward. It was as if God was in the midst of the conflict, bringing us safely through to a much better place. It gives us all more room to grow, and helps launch a weekly home group meeting which should really serve the core, as well as being a building point for those that have shown an interest in what we are about. And on the back of this, Rebekah, who we've mentioned already, and talked about praying for in the last October update, has stated that she is planning on moving here in February next year, to help out with the church plant! This is fantastic news, and though the details are not sorted out (like job, where she will live etc! ), it is a great statement of faith. Please pray that she gets some great options offered to her, that allow her both to build relationships and flourish, whilst giving her time to get stuck in with Hope:Tallinn events. She is wanting to come and help establish a Children's ministry, serving both those within the church, and as options develop, those outside. She would be a great blessing, so please be lifting her in your prayers as she outworks the practical elements of this over the next two months. Arriving at the coldest point of winter, pray for a great adjustment - I guess, it can only get warmer for her! She would be the 8th adult member of the team - and we are praying that the current core doubles to 14 (very quickly!!??) in order for us to think about launching the church plant into the next phase. Last month saw some more visitors, and actually the last for the year. As well as having Rebekah with us for ten days, we also had a visit from Colin Baron (Manchester, UK) with Dave Henson (Cardiff). They spent a few nights in Tallinn, having come from St Petersburg. Dave, because of his back, stayed in a local hotel, to give him space to move around in the night, without disturbing anyone. They spoke at our midweek meeting, and I had as much time as I could with them. For Colin it was his first time in Estonia. I don't think it will be his last. And then just a few days after they both went, Rachel's mum and dad came to stay for five nights. They were a real blessing and Mia and Anya especially enjoyed having Grandma and Grandad around for the weekend. December and January are clear, and will be kept that way. As a family there has been a lot of pressures, which is natural in our situation, but it seems a good time to pause a little, and enjoy the holiday when we get to Christmas. The girls are also getting busy with school plays and ballet concerts, as is normal for this time of year, so it gives us the space to enjoy these events with them. As a numbers man, I totaled up the visitors this year. March and December will have been the only months that no one was staying with us, but if you take each nights sleep someone has had, and put them in a row, it comes to 136 nights out of those 10 months. Of course, most of these have been multiple people staying at the same time. On the other side, there were also 54 days when one (usually this, and usually me) or all of us where away from home, often in another country. This fact alone is so different to what life had been in Russia, and especially in England. The main events that are now happening each month are a big meal together once a month, as well as the focused men's and women's events. For the men, this has been Poker nights at our home which I have hosted. It's great for building friendships together, creating a bridge in our relationship where we can meet at other times to talk, and is also just about having some fun! I'll say it again, as I've said before - we do not play for money! For the ladies, Rachel has recently hosted a SPA event, which is the second time they've done that. And all of them together are building community. It's ironic that while most people in the world now live in cities, statistically mankind is now the loneliness we've ever been. Simply having people living around you doesn't cut it - unless you are part of a community. And we've seen, through the meals and these other events, a community emerging. Having come here not knowing anyone, we've seen friendships developing. And as life gets busier, our prayer and battle will be to keep space for relationships, and building others into communities. And it's also just a good principle to bless the city - to be a blessing to those around us, regardless of their beliefs. Another way this was recently outworked, was Rachel hosting a baby shower at ours for a lady from another church. We are really friendly with them, have served them on a Sunday a couple of times, and it was great to help make the event possible, by hosting and organising the event. It's Rachel working to one of her main strengths - hospitality. Health has been a bit of an issue with the girls (Rachel included!) over this last month or so. Both Mia, and Anya more so, have missed days at school/kindergarten. Rachel has been fighting something for some time - and if I'm honest, as I'm writing this, I'm starting to not feel so good myself. It seems we really do need a cold snap to kill off these nasty viruses. Your prayers for health would be appreciated! It is also now a year ago since I was taken to hospital in an ambulance, not being able to walk. And twelve months later, the time they said it would take to fully recover, I can say I'm getting better all the time. I will of course be careful - it was when the snow first arrived last year, and something I did moving the snow, that caused it all in the first place! So while it has been a challenge on many fronts, I am looking forward to really enjoying this Christmas and winter, which were a struggle last year. Something that came to head with the visit of Dave last month, was this issue of family income. While we are only in the early phases of church planting in Estonia, we have also already been away from the UK for over five years now. So it's been natural that churches and individuals have felt they were unable to continue with their monthly giving. While we continue to live by faith, with about half our income coming through faithful giving (not only from the UK), we are thinking about ways to press through with finance. For the last few years, we've been living on a very fine line, and this last year in Tallinn actually spending more than came in. In relation to paid work, I am now working two days a week for my old full-time UK job, which I've been doing some hours for ever since we first left the UK. This year, I launched a business as a language agency. While that is getting some teaching work in (all Rachel's lessons are now going through the company) it's yet to really stand up on it's own two feet as a business - please pray for continued favour on this - as well as with my writing. My book is continuing to sell, and I am well on my way to finishing the second novel as well. I really hope that this can be released in 2014. My official Author Page recently went live on Facebook - please be sure to connect to it here. By liking the page on FB, it allows your friends to see the page, and increases my reach. I am so thankful to everyone that has already done this. If you haven't yet, please do. It means so much to me. And long term, I really hope to be able to focus solely on writing as my trade. I believe this is the career God will open up. For this, I really do need your prayers. This all being said and done, there is a real need now for income, so I am exploring the options of increasing my working week to full time - by either finding a part time job in Tallinn for three days a week, and still doing my two days in the UK, or needing a full time job here. This option does scare me if I'm honest. It would be a huge change to life here, and a real challenge to fit everything else in with church. The wider travel side I would need to lay down, and as the church grows and approaches its launch, again, that would be a challenge for time. But I do tend to focus on the specifics and not look too far ahead. While I would love the business to take off and my books to sell rapidly, it might well be that in the mean time I need to take on some more work. Please pray for the right job - the perfect job that pays well and matches my skills. Having started looking, I am already really limited with options. Due to language and experience, my skills are more easily fitted to the UK market. But I only need one job that's right for me. Please pray, in what ever God wants, that this whole situation changes rapidly. We know God has the perfect way through. St Petersburg - next week! As I check the calendar to see when it is that I am going, I had a mild panic to realise it's only the end of next week when I am going back to St Petersburg. I am travelling on the Thursday with Stephen from the team here, and Arnoud and Enrico will be joining us on the Friday. We'll have the whole weekend in the city, encouraging the church there, and exposing both groups to each other. Please pray for a blessed trip, and like in Holland, as the four of us spend more time together, for great fun and memories to be formed. We travel back to Tallinn on Monday 16th December. Mia had a small part in a ballet show yesterday and has a bigger role, where we will all be there to watch, in the middle of next week. Both girls are continuing to enjoy life. Both are so much fun, though we are aware with Mia's school, there is a lot of pressure put on the students. She gets hours of homework each week. It's often hard for us to keep on top of it. They are both speaking Estonian well, in their own little way. Anya certainly understands a lot, and is the one most surrounded with it, when she is in kindergarten. Mia's Estonian class teacher has mentioned to Rachel how well Mia is picking up the language and that she has surprised her with the things she has understood. 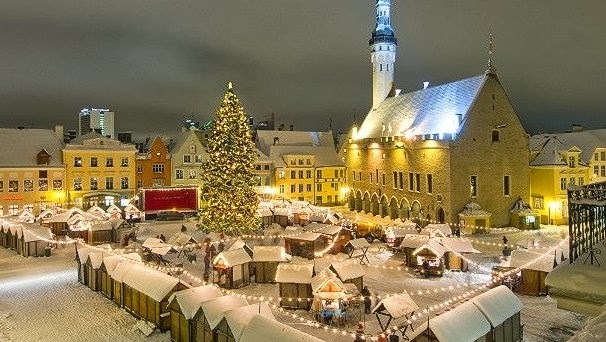 We will be staying in Tallinn this Christmas - the tree should be going up next weekend, which I guess will also feature in the annual Animoto video greeting that I will try and get around to doing soon! We'll leave you with some prayer pointers. Thanks for reading this year - the blog went through the 20,000 visitor mark last week - an incredible thought! Thank God for every visitor we've had this year! Thank God for the great communities that are developing!